The southwestern monsoon is characterized by spatial and temporal variability. Storm events are interspersed with breaks of limited activity as migrating high pressure systems and available moisture dictates where in the Southwest rain might fall. This results in highly variable precipitation totals on a daily or weekly timescale. Regional climatology gives some indication as to the expected cumulative total precipitation any location might expect but says less about how those precipitation totals will be achieved. Any given year of monsoon activity is difficult to categorize on a week-to-week basis, and simple score-carding using seasonal precipitation to date will be skewed by recent runs of heavy rain or extended breaks in the monsoon. Totals should even out over the course of the season and vary around the long-term average, but outliers and extremes are always possible. Oceanic and atmospheric indicators of the El Niño-Southern Oscillation (ENSO) remain in the range of neutral conditions (Figs. 1-2). 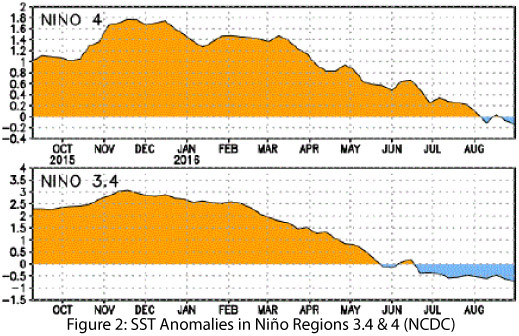 In the last month, seasonal forecasts and models further reduced their certainty of a weak La Niña event forming in late 2016 or early 2017. The current projections find ENSO-neutral conditions to be the most likely outcome for this fall and winter, although the chance of a weak La Niña event cannot be ruled out. As past outlooks have noted, there was ongoing uncertainty regarding the prospects for La Niña, especially as it appeared to be having difficulty organizing, with limited coordination between ocean and atmosphere. 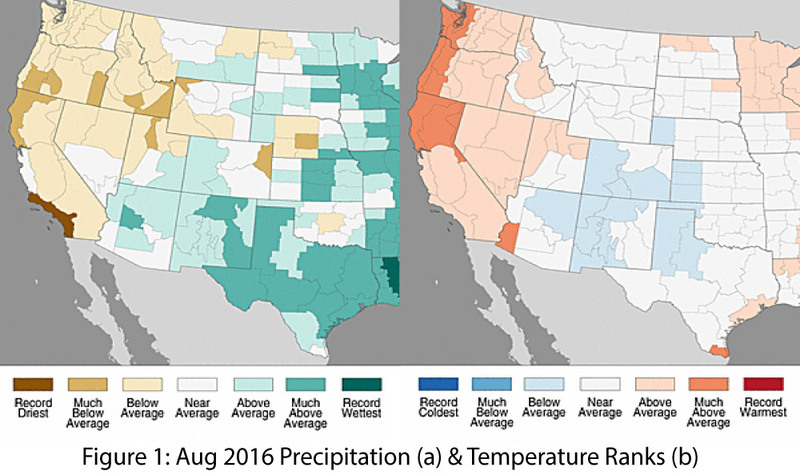 Precipitation & Temperature: August precipitation totals were above average across most of Arizona and New Mexico (Fig. 1a), buoyed by a surge of monsoon storms that started in late July and extended through the first week of August, and a surge of moisture linked to Tropical Storm Javier in mid-August. 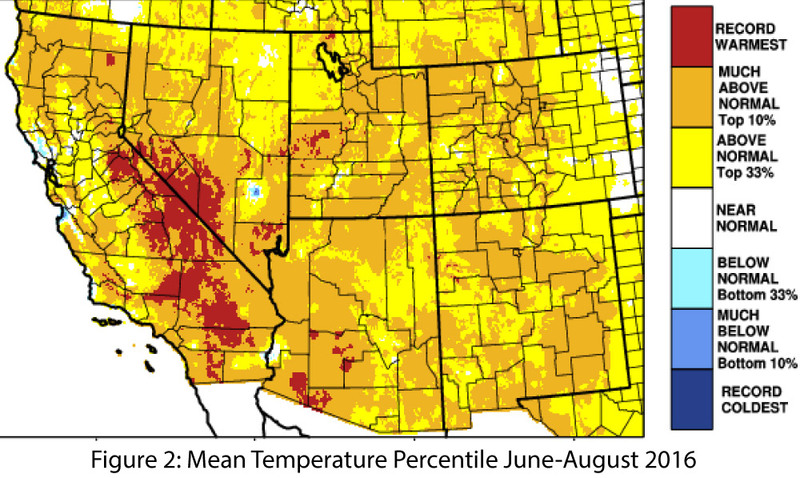 August temperatures were mostly average to below average in Arizona and New Mexico (Fig. 1b), a decline that did not alter the overall seasonal pattern of very warm temperatures observed during the summer months (Fig. 2). 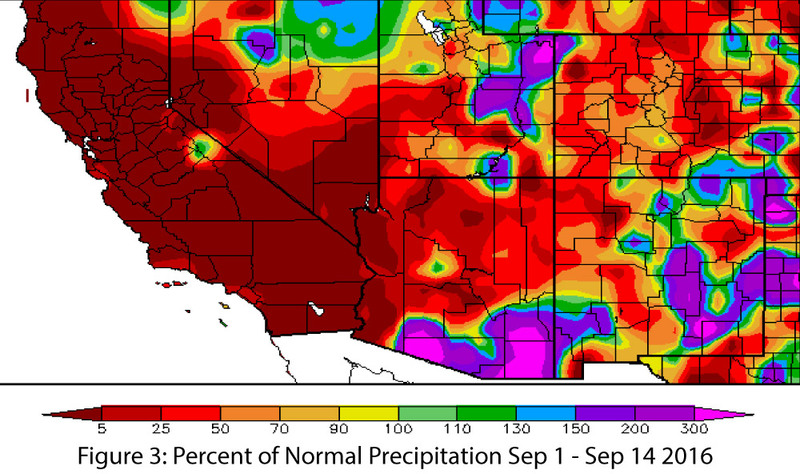 September precipitation to date (Sept 1 – Sept 14) ranges from well above average in southeastern Arizona and portions of New Mexico, tied mostly to heavy rains during Hurricane Newton, to well below average in other areas of the region that did not record as much activity during this time (Fig. 3). 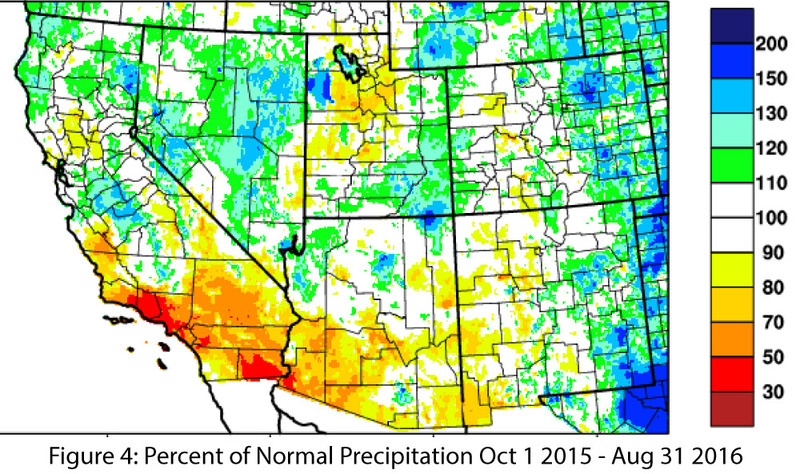 Water year precipitation to date (Oct 1, 2015 – present) is below average in much of the Southwest, particularly in Southern California, most of southern Arizona, and western New Mexico (Fig. 4).